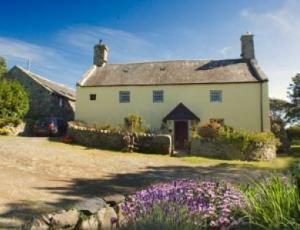 Llwyndu Farmhouse01341 280144work Guest AccommodationA uniquely located historic farmhouse, recently tre-ring dated to 1581, and converted Granary provide very comfortable and peaceful rooms for bed & breakfast and an intimate licensed restaurant for informal candlelit dining. On a sunny clear day the view over Cardigan Bay is beautiful and the regular sunsets are quite spectacular. 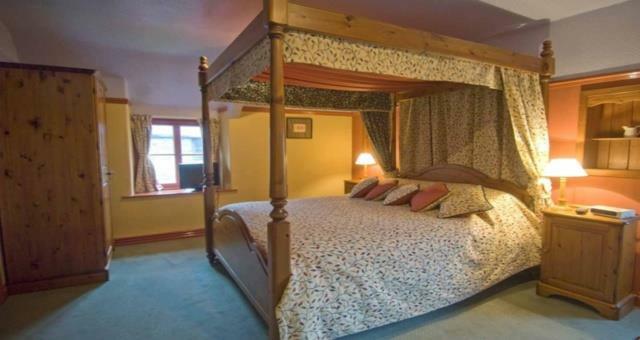 There are two four-poster bedrooms and further double and family rooms all with en suite bathrooms. All bedrooms have sofa, TV, radio, beverage making trays, central heating and great character. Colours are bold and the fabrics sumptuous, particularly in the four-poster rooms while other rooms have a more subdued décor – a choice! Family rooms have bunk beds and parents usually now bring their own alarms. Cots are available. Centrally heated throughout with log fires in the colder months. A very friendly and informal welcome awaits to invite you to kick off your shoes and make yourself feel at home, have a drink and relax in this small family run hotel. A short menu of 3-4 choices per course changes daily and fresh fish and vegetarian choices are always on offer. Llwyndu is fully licensed and supplied by Tanners of Shrewsbury, some local microbrewery bottled beers and organic ciders. The hotel is situated in a quiet location a few hundred yards to the east of the A496 and 2 miles north of Barmouth. There is ample car parking. Note: being in such an old building, the accommodation fully respects this and modern facilities have been introduced without any compromise and it therefore does not follow the current fashion of removing the rich patinas of history in search of a minimalist, boutique, décor. Llwyndu can offer a 10% discount to residents for any golfers wishing to play the Royal St. Davids 18 hole course in Harlech and at five other courses in the region. A uniquely located historic farmhouse, recently tre-ring dated to 1581, and converted Granary provide very comfortable and peaceful rooms for bed & breakfast and an intimate licensed restaurant for informal candlelit dining. On a sunny clear day the view over Cardigan Bay is beautiful and the regular sunsets are quite spectacular. Two miles north of Barmouth. When street lights end next turning on right.